FILE - The Rev. Jesse Jackson speaks to reporters at the Operation PUSH Soul Picnic in New York, March 26, 1972, as Tom Todd, vice president of PUSH, from second left, Aretha Franklin and Louis Stokes look on. 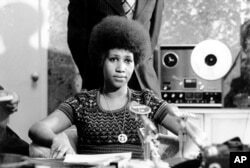 FILE - Aretha Franklin appears at a news conference, March 26, 1973.